Mangos are widely grown as a backyard tree in almost every area of Hawaii. It grows on generous trees, large and shady, that can continue to fruit for decades. It is thought the first varieties of mango plants were brought to Hawaii around 1824 from India and the Philippines. Here in Hawaii we may not have the traditional four seasons, instead we have hurricane season, whale watching season, volleyball season, and mango season. Mangos are an excellent source of vitamins A and C, as well as potassium and of course – beta carotene. There are many popular varieties available now in Hawaii. Golden Glow – A cultivar from Kihei, Maui that has a medium sized fruit (20-24 ounces) with little fiber, a thin seed and nice creamy flavor. Gouveia – Large fruit averaging 16-24 ounces per fruit. Flesh is sweet, fiberless. Bears usually in August. Haden – A long-time favorite in Hawaii, Hadens average between 16-24 ounces. It is of round, oval shape and has yellow color with a red crimson blush. The flesh is slightly fibrous but has a full, sweet flavor. Fruits are ready to harvest around June-July. History of the Haden: In 1902, Captain John J. Haden, retired and living in Coconut Grove, Florida, planted four dozen seedlings of ‘Mulgoba’ mangoes. He died the following year, but his wife Florence cared for the trees at their property and they first fruited in 1910. One tree in particular produced excellent fruit, with brilliant color and good flavor – this cultivar was selected and given the family name, Haden. Analysis indicates that ‘Haden’ is most likely a cross between ‘Mulgoba’ and a ‘Turpentine’ mango. Keitt – A large sweet and low fiber fruit averaging 2-4 pounds each with a thin seed. Ripe skin is green with a purple or reddish blush. Harvest is around August to October. 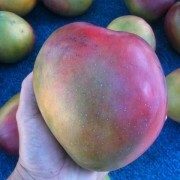 Mapulehu/Joe Welch – A large mango, usually around 16-20 ounces, juicy and delicious with no fiber, mainly ripe in July. Nam Doc Mai – A Thailand variety, slender fruit with thick greenish-yellow skin. The flesh is very sweet, juicy, and fiberless. It fruits mostly around June and July. The flesh is fibreless, very sweet and juicy. It can also be eaten when green. Pirie – An older variety, the flesh of the Pirie is juicy, fibreless, and sweet. Fruit size is 8-10 ounces, ripe in July and August. Rapoza – Quite famous, this is a medium sized, fruit of excellent quality that can range between 15-30 ounces. The seed is thin and fiberless. The ripe skin is yellow with a reddish or purple blush. This variety comes into fruit usual July and August. – Always wash your mango before eating. – There are many ways to eat a mango: peel off the skin and eat everything but the seed; cut in have lengthwise, twist in half, remove seed and enjoy with a spoon; cut into wedges or cubes. – Mangos are mostly eaten fresh, but are also used a lot in making juices, preserves, puddings, sorbets, ice creams and other desserts. – Green mangoes are often pickled or made into chutneys. Its difficult to rely on color indication for a ripe mango since there are such different varieties and various color schemes, certain mangoes can be eaten and are sweet when green. Ripe mangoes smell fruity at their stem end and ready to eat when slightly soft to the touch. Avoid mangoes with too many black spots, its a sign of the start of rot, which actually starts on the tree. A few small ones are ok but only if you are going to eat that day. To speed up ripening store mango in paper bag on the counter. Ripe mangoes can be stored in the refrigerator for a few days. Mangoes can also be peeled, cut, packed in air tight containers or bags, stored in the freezer for future smoothies.